Washington/Atlanta, Sep 12 (IANS & Staff): More than 1.5 million people have been asked to evacuate their homes along the Virginia, North and South Carolina coasts as Category 5 storm Hurricane Florence approaches, an official said. It is expected to make landfall in the area later this week. Hurricane Florence is packing sustained winds of 140 miles (220 km) per hour and remains an “extremely dangerous” Category 4 storm as it approaches the US eastern coastline, specifically the Carolinas. Georgia’s Governor Nathan Deal has issued an emergency declaration for all of the state’s 159 counties. Georgia is expected to see tropical storm-force winds and rain in some spots. 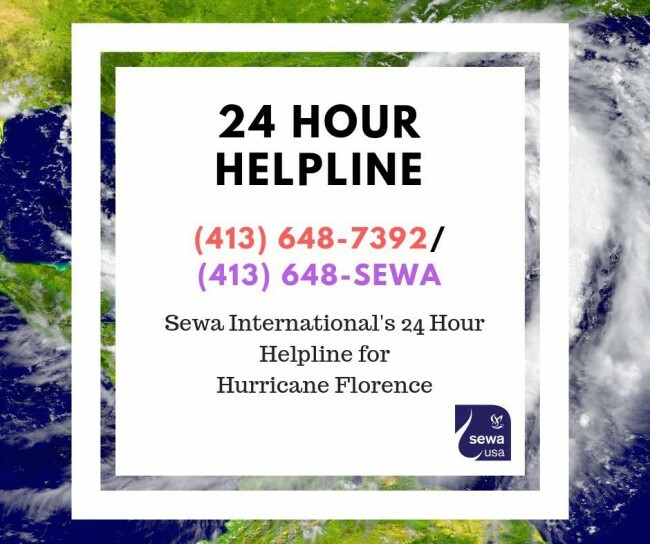 Atlanta based organizations like Indian Friends of Atlanta (IFA) and Sewa are organizing shelters for those in the path of the hurricane. “We have 2 shelters available as of now and simultaneously we will be working for other shelters as when they are required,” IFA said through a statement. “Please forward this message to your friends who are in need of shelters. Please contact info@ifaworld.org or 470-253-4IFA(432). In its 5 p.m. advisory on Tuesday, the Miami-based National Hurricane Center said that the eye of Florence was located 580 km south-southwest of Bermuda and 1,260 km east-southeast of Cape Fear, North Carolina. It is likely to become a Category 5 before landfall. The NHC experts warned that “life-threatening storm surge (is) possible along the coasts of North and South Carolina”. “Further strengthening is forecast tonight and Wednesday. While some weakening is expected on Thursday, Florence is forecast to be an extremely dangerous major hurricane through landfall,” the NHC said. The first waves directly kicked up by the huge storm system should begin coming ashore late Wednesday. Florence was expected to bring very heavy storm surge, rain and flooding to the entire region on Thursday, Friday and Saturday. Beyond the Carolinas and Virginia, which were expected to bear the brunt of the storm, rain and flooding were expected through next week in certain parts of Tennessee, Georgia, West Virginia, Ohio, Pennsylvania, Maryland and the District of Columbia. Maryland and the District of Columbia have declared states of emergency. President Donald Trump declared a state of emergency in North and South Carolina, thus facilitating federal aid to those states. He also cancelled several campaign events he had scheduled for Thursday and Friday. “The safety of the American people is my absolute highest priority. We are sparing no expense,” Trump told reporters in the Oval Office after meeting with Department of Homeland Security and Federal Emergency Management Administration officials. The storm surge will bring significant flooding of between 9-13 feet from Cape Fear to Cape Lookout, including the Neuse and Pamlico Rivers, 6-9 feet between North Myrtle Beach and Cape Fear, and 2-4 feet to the area between Edisto Beach and Murrells Inlet. A total of 15-20 inches of rain is expected, with isolated areas of up to 30 inches in parts of North Carolina, Virginia and the northern part of South Carolina through Saturday. So far during in 2018 Atlantic hurricane season there have been nine tropical storms, of which five — Beryl, Chris, Helen, Isaac and Florence — have become hurricanes.